What if you could get every day off to a good start? You can. 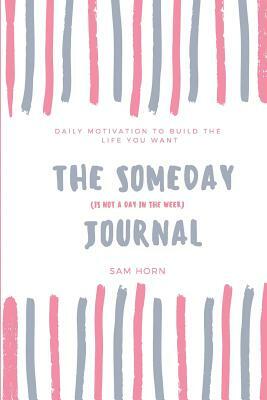 This quote-a-day journal can touch your heart, make you laugh, and inspire you to make your life, work and relationships more of what you want them to be ... now, not someday. Keep this SOMEDAY (is not a day in the week) Journal on your nightstand, desk or kitchen table. Create a 5-minute morning practice reflecting on and savoring that day's quote. You wouldn't gulp down a fine wine. Don't gulp down this fine wisdom. Ask yourself: "What does this quote mean to me? How can it help me set an intention for the day? How can it help me be a more giving, gracious, grateful person? What is one specific action I will take today to be happier and healthier? May this journal help you be more present to - and appreciative of - your days so you live them more fully. - Sam Horn, CEO of The INTRIGUE Agency and author of Tongue Fu , POP , IDEApreneur, SOMEDAY is Not a Day in the Week and Washington Post bestseller Got Your Attention? is on a mission to help people create the life, work and relationships of their dreams. Sam's TEDx talks and books have been featured in the New York Times, on NPR, taught to Intel, Nationwide, Capital One, Cisco, Accenture and YPO, endorsed by Tony Robbins, Dr. Stephen Covey, Brian Tracy and Sheri Salata, (Executive Producer of The Oprah Winfrey Show) who calls her "one of the bright lights and most accessible wisdom-sharers of our time." Want info on Sam's other books and presentations? Visit www.INTRIGUEagency.com.